With the accession of Fernando III to the throne in 1230, both kingdoms were definitively united, and in general, the new king was accepted by the nobility and leading clergy as the legitimate successor to Alfonso IX. Nevertheless, a group of nobles led by Diego Froilaz refused to render homage to Fernando III, claiming instead the rights to succession of their step-sisters, Sancha and Dulce. 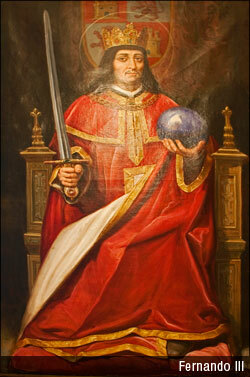 Froilaz managed to occupy the Basilica of San Isidoro, demonstrating with this act that not all León accepted the legitimacy of the new king. However, sudden illness obliged him to abandon resistance and restore the Basilica of San Isidoro to the Abbot. Once the foci of rebellion had been subdued, Fernando III negotiated succession with his step-sisters in order to avoid future civil war. Apart from a few attempts at secession towards the end of the 13th and beginning of the 14th centuries, the union of the two kingdoms was definitively sealed. The reign of Fernando III was characterised by territorial expansion. The royal armies spread over Muslim territories, reducing Muslim rule basically to the Kingdom of Granada. León nobles such as Fernando Suárez de Quiñones, Ramiro and Rodrigo Froilaz, Fernández de Aller, and Pedro Ponce, among others, played a major role in these conquests. To digress for a moment, a symbolic event which resonated widely at the time should be mentioned. The surrender of Cordoba on the 29th of July, 1236, marked the end of the chapter where, in the times of Almanzor, the Muslim world represented a serious threat. In 997, Almanzor had destroyed Santiago de Compostela and carried away the doors and bells of the cathedral to Cordoba, on the backs of his Christian prisoners. Now, Fernando III restored the bells, transporting them in turn on the shoulders of his Muslim prisoners and thus returning the insult. His successor, Alfonso X, resolved the Kingdom of León’s border issues with Portugal, which were linked to the vassalage the Portuguese were obliged to render to the king of León. The dispute was settled through the marriage of Alfonso X’s daughter to the Portuguese monarch and the disputed territories were ceded as dowry. Alfonso X’s will provoked a dispute between the children of his first-born son, Fernando de la Cerda, who had died prematurely in 1275, and his second-born son, Sancho IV. In accordance with Las Siete Partidas (the Seven-Part Code) enacted by Alfonso X, rights to succession fell to the children of his first-born son. These laws broke with traditional succession rights, according to which the crown would normally go to the second son should the first-born no longer be alive. On the basis of traditional succession rights, Sancho IV claimed the throne and rebelled against his father, leaving the latter with no support and obliged to seek the help of the Muslims to impose peace. On his deathbed, Alfonso X would pardon his son. The loss of Alfonso X prompted a series of confrontations between the supporters of the children of Alfonso X’s ill-fated first-born son and their uncle, Sancho, later Sancho IV, who asserted his candidacy to the crown and reigned from 1284 to 1295. Following the death of Sancho IV, the prince Don Juan, brother of the deceased monarch, proclaimed himself king of León and reigned from 1296 to 1301, exploiting the fact that Fernando IV was in his minority. The reign of Alfonso XI (1312-1350) was marked by the process of centralisation of the Kingdom. With the 1348 Ordenamiento de Alcalá (a collection of 58 laws), the monarch succeeded in making cities and towns submit to royal rule. The succession of Alfonso IX generated conflict between the legitimate successor in the person of Pedro I and the illegitimate line, led by Enrique II, who finally vanquished and thus founded the Trastámara dynasty. In this war, León was one of Pedro’s strongholds. The 15th century was marked by the expulsion of the Jews in 1492, with consequent negative effects on commerce and trade in León. During this period, the practice of Transhumance was the main economic mainstay of the Kingdom of León. The politics of the Hapsburgs in the 16th century resulted in a level of economic and demographic decline in the Kingdom of León. The direction given to the economy and commerce, focused on Seville and the New World, led to reduced economic activity in the Kingdom of León and the ancient capital’s Fair fell into oblivion. The situation only grew worse after 1609 with the expulsion of the Moriscos (Muslims who had converted to Catholicism), which deprived tradesmen and agriculture of a valuable labour force. In the context of this complex economic framework, the generalised crisis which devastated Spain in the 17th century fell particularly harshly on León and Castile. Nevertheless, not all was gloom. 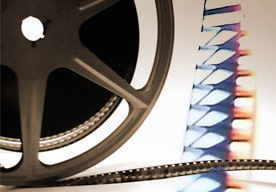 Important works of literature, sometimes written in Leonés (the language of León), were once again produced in the Kingdom, by writers such as Juan del Enzina, Lucas Fernández and Torres Naharro. 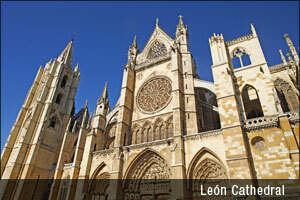 With the dawn of the 18th century and the rise of the Bourbon dynasty, the Kingdom of León entered a new phase. Societies of Friends of the Country emerged in Ciudad Rodrigo, León and Zamora with the aim of improving the economy and promoting education. This was a period of intense cultural activity, with figures such as Diego Torres de Villarroel and José Francisco de Isla (also known as Padre Isla). Floridablanca’s nomenclature of Spain, produced at the end of the 18th century, maintained the distinctive administrative organisation of the provinces of the “ancient kingdom of León”, and thus the figure of the village mayors within the framework of a larger municipality, and the council system, continued. Floridablanca’s 1785 classification of Spanish territory included eight regions and thirty one provinces. One of the regions was named the “Kingdom of León”, containing the provinces of Asturias de Oviedo, León, Zamora, Salamanca, Palencia, Valladolid, Toro and Extremadura. Also created were the Intendencias, administrative regions organised on the basis of Crown taxation, and these included Galicia, León, Zamora, Toro, Salamanca, Extremadura, Palencia, Valladolid, Ávila, Burgos, Segovia, Soria, Guadalajara, Madrid, Toledo, Cuenca, La Mancha, Seville, Cordoba, Jaen, Granada, Murcia, Biscay, Guipuzcoa, Alava, Navarre, Aragon, Catalonia, Valencia, Majorca and the Canary Isles. During the war of Independence, León suffered some of the darkest moments in its history. 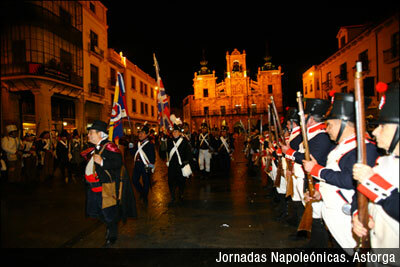 The French occupation of Spain provoked an immediate uprising against the Napoleonic troops, the first of many, led by the Junta (regional government) of the Kingdom of León and the city of León. In the absence of the legitimate king, the Junta of the Kingdom of León assumed sovereignty over the kingdom’s territory. In addition to the “habitual” atrocities committed by the French troops, they launched an authentic attack on the heritage, history and identity of the León people. The Royal Pantheon was assaulted and the tombs of the León kings profaned and used as drinking troughs. Following the defeat of the Napoleonic armies, the Cortes Generales de España (the Spanish parliament) approved the 1812 Constitution on the 19th of March, 1812, popularly known as “La Pepa”. León had sent seven representatives, who were detained by the Junta of Old Castile, and released by order of the Junta Central. In the subsequent territorial reorganization, León was recognised as an administrative territorial entity. Felipe Bauzá divided the province of León into two parts, León and Astorga, the latter including the Maragatería region, the Bierzo region and other areas. This ephemeral division lasted a year. In 1822, a new administrative division was imposed, creating the province of Villafranca, which included the Cabrera region, Valdeorras, the councils of the Sil River and other mountain territories. This division was also to disappear, in the year 1824. In 1833, Javier de Burgos gave shape to the present-day system of territorial organisation. The region of Liébana was severed from León to be incorporated into Santander, and the Kingdom of León was divided into the provinces of León, Zamora and Salamanca. With the inauguration of the 1st Republic in 1873, an initiative emerging from Valladolid attempted to form a federal Castilian State which would include León territory, an initiative which the Provincial Commission of León roundly rejected, requesting respect for León autonomy. Salamanca formed its own independent canton. 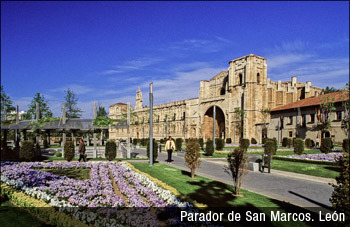 As regards the economy in the 19th century, there was a resurgence of the textile industry in Zamora and Bejar, and the flour industry was established in the Tierra de Campos region in León. The arrival of the railway improved communications. Despite high rates of emigration in the 19th century, León witnessed population growth. Outstanding figures in the world of culture included Gil y Carrasco, Luís Maldonado, Gabriel y Galán and Cayetano Bardón, this latter producing his noteworthy “Cuentos en dialecto leonés" (short stories in the León dialect), written in the León language and constituting a homage to this language. In the first half of the 20th century, economic growth was stimulated by growing demand for the products of cattle-rearing and mining. The heady air of freedom which arrived with the 2nd Republic did not, however, breathe into the León desire for autonomy. The Republican Government refused to contemplate this possibility, despite the existence of various parties in favour of autonomy, such as the Partido Republicano Leonés Autónomo (the León Republican Party for Autonomy) or Acción Agraria Leonesa (León Agricultural Action). During the Civil War and the post-war period, many León people were trapped in the mountains of León and Salamanca. Some were still roaming the mountains thirty years after the end of the war, maintaining their opposition to Franco’s regime through the use of guerrilla tactics. During the Franco dictatorship, new territorial organisation endowed León with the provinces of León, Zamora, Salamanca, Valladolid and Palencia. This division was based on a certain logic, since a large part of the Tierra de Campos region had been the subject of dispute between the León and Castile crowns, and for most of their history these lands had formed part of the Kingdom of León. It was Pedro Ansúrez, León subject and faithful noble in the court of Alfonso VI, with whom he shared exile in Toledo, who had been responsible for resettling Valladolid. During the Transition, numerous groups emerged in the three provinces calling for autonomy. On the 13th of January, 1983, the León County Council, governed by the UCD or Unión del Centro Democratico political party (Union of the Democratic Centre), proclaimed its desire to secede from the “Castilian-León” entity, and constitute a single-province autonomous region. This proposal received 22 votes in favour, from the UCD and the AP or Alianza Popular (People’s Alliance) parties, and 4 votes against, from the PCE or Partida Comunista de España (Communist Part of Spain) and the PSOE or Partida Socialista Obrero Español (the Spanish Socialist Workers’ Party). The Town Council of Ponferrada took a similar stance with the same result. On the 29th of January, 1983, more than 20,000 León people led by the Mayor of León and the president of the County Council took to the streets in protest against the union with Castile. 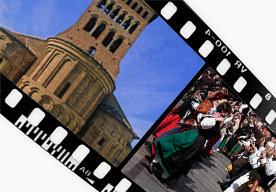 In spite of their efforts, León remains the only historical region which has not been granted autonomous status. The present Statute of Autonomy amalgamates the territory of the Kingdom of León with the provinces of Castile. The Statute corresponds to a strictly political approach, and was advocated by the then Minister for Public Administration, Rodolfo Martín Villa, who was born in León. It is curious that at that time, Martín Villa’s own political party, the UCD, which held the majority in the County Council, carried out a province-wide survey on autonomy. It was Castile’s loss of the provinces of La Rioja and Cantabria which favoured the inclusion of León in the present day autonomous region of Castile and León. The union of the two kingdoms did not imply a loss of its identity as separate from Castile for the Kingdom of León. The institutions of both kingdoms continued to operate autonomously throughout the 13th century and beginning of the 14th century. The Royal Cortes of León met and deliberated independently of that of Castile throughout the 13th century, both in the city itself and in other centres. It was in the 14th century that the two Cortes began to hold joint meetings, and it was not until the reign of Alfonso XI that one can really begin to speak of a León and Castile Cortes. The councils emerged in the 10th century with the aim of resolving everyday problems, organising economic resources and managing resources held in common. These local associations guaranteed the defence of individually and collectively held property and were, in addition, an expression of popular democracy. The councils tended to group together in order to exert greater influence, and it was this association of councils that would constitute the Hermandad del Reino de León (the Brotherhood of the Kingdom of León). The open council has survived through the centuries to the present day, and many villages still meet in open council to resolve local issues. It was common for people or villages to form associations in the Middle Ages in order to provide mutual assistance or defend their interests. Cities and towns also united to exert greater political and economic influence. Such associations were called hermandades (brotherhoods), and emerged as a result of political instability at the end of the 13th and beginning of the 14th centuries. These brotherhoods were legalised in 1295, and each kingdom formed its own. The Brotherhood of the Kingdom of León was composed of the councils from thirty one cities and towns within the Kingdom territory, which included Galicia and Asturias. These met annually in the city of León to discuss issues relating to the administration of justice and the maintenance of order. In 1315, an attempt was made to bring the brotherhoods of the various kingdoms together in a single General Brotherhood, but the resistance of those from León, Toledo and Extremadura to meeting with those from Castile led to the dissolution of the General Brotherhood in 1318. One of the most noteworthy features of the judiciary system in the Kingdom of León was the Liber Tribunal. The Liber Tribunal acted mainly as an appeal court and met in the Locus Apellationis of the Cathedral of León. The name came from the Tribunal’s application in sentencing of the Liber Iudiciorium¸ an ancient judicial code that was the legacy of the Visigoth world. The Liber Tribunal was an institution unique to León. The Chancellery of the Kingdom of León was created in the times of Alfonso VII, and it continued to maintain its autonomy following union with Castile. 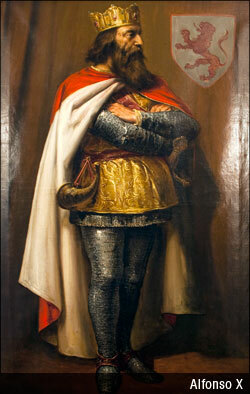 The attempts made by Alfonso X and Sancho IV to unite the chancelleries of León and Castile were in vain. Over time, the power of the chancelleries faded, becoming no more than an honorary title for the holder. Notary offices wielded great influence within administration. Four were created initially, with jurisdiction over the territories of León, Castile, Andalusia and Toledo. At the 1295 Cortes, these were reduced to two, the Notary Office of León and that of Castile. Notary offices were responsible for drawing up, protecting and holding the different documents which corresponded to their territory. Administration of the new kingdom was divided along territorial lines, into county sub-divisions which received the name of Merindades in the kingdoms of Castile, León and Galicia, and Adelantamientos in the remaining territories. The difference between the Merino Mayor (officer in charge of the Merindad) and the Adelantado (officer in charge of the Adelantamientos) lay in their scope of action. Thus the Merino had judicial powers whilst the Adelantado, located in territory bordering the Muslim world, had military functions. In practice, this difference did not hold, and both figures assumed the same military, judicial, administrative and economic powers. Over time, the title Merino disappeared in favour of Adelantado. TBoth the Merino Mayor and the Adelantado represented the highest rank in territorial administration, posts which were traditionally occupied by the nobility. In 1402, Asturias was separated from the Adelantamiento of León, and this separation was maintained until the middle of the 17th century. The Adelantamiento system survived until 1799. The Ombudsman of the Kingdom of León, also known as the Procurator General of the Adelantamiento, was another post of responsibility. Its purpose was to provide judicial assistance to the disadvantaged, and the office had jurisdiction over the entire territory of the Adelantamiento of León. As with other institutions, the Church in the Kingdom of León also acted independently of that of Castile. For practically an entire century, the ecclesiastical representatives of both kingdoms held their synods separately. The merging of the two kingdoms did not result in a radical change to daily life in the Kingdom of León. León maintained its customs, currency and even the symbols representing the Kingdom. Administration and the judiciary continued to be autonomous throughout the 13th century. However, with the arrival of the 14th century and, above all, the reign of Alfonso XI, came a centralising initiative, and the autonomy of León ceded in favour of the Crown of Castile. The centralisation process of Alfonso IX was exclusively administrative. The León people maintained intact their sense of having been born in a unique and proud nation, to which the present State owes its territorial, legislative and cultural foundations. This feeling is embodied in the traditions and customs which the León people have maintained alive throughout history.